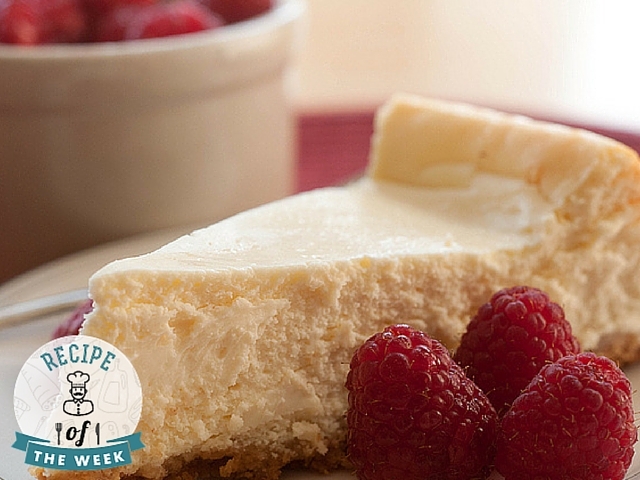 The ideal dessert, this baked cheesecake is a decadent way to end the evening. Simple yet refined, it is sure to please the crowd. Preheat oven to 325 F. Butter a 9-inch baking pan. In a mixing bowl, combine the melted butter and the crushed cookies; combine thoroughly and transfer to the baking pan to form a crust. Now combine the sugar and flour in the mixing bowl; reserve. In a separate bowl, place the cream cheese and use a hand mixer (or stand mixer) to beat it until it forms a smooth consistency. As you mix, add the sugar in slow batches and thoroughly combine. Add the vanilla and cream while slowly mixing the batter. Pour in the egg yolk, followed by the 3 eggs, one at a time. Once the batter is completely mixed, pour it on top of the crust in the baking pan. Bake 45-60 minutes, or until the edges are golden brown (the center should be slightly set.) Turn off oven and cool for another 60 minutes. Remove baking pan from oven and cool for another 90 minutes. Transfer to fridge until ready to serve.